I threatened Jen with another stew tonight as winter winds down. She reluctantly agreed but asked that it be our last stew for a while. I suspected that two stews in a row might be a bit much but I'm all about pushing the envelope here. 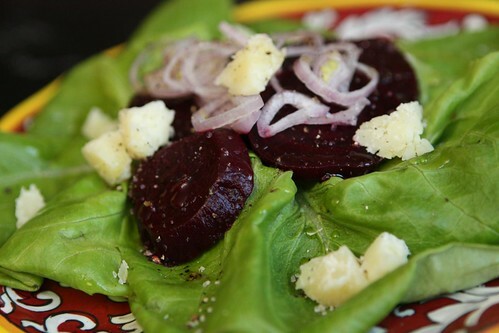 I started off with this salad which I made with butter lettuce from Gotham Greens, sliced beets, Manchego, sliced shallot, olive oil, salt, and pepper. I was on the fence about adding balsamic glaze but opted to go simple on this one. The greens were quite nice. Who knew you could get decent greens in March that are grown right in New York City? This is a triumph even though one of my greatest annoyances in life is people referring to New York City as Gotham. I'm not quite sure why it annoys me as much as it does. Probably because people who refer to New York City as Gotham are just so pleased with themselves when they do so. The Manchego in this dish is there to represent the cheese-eating grins of the jerks who still insist on referring to New York City as the city where Batman lives. In a surprise twist I did not stew the chicken! We had dinner the other night at Delicatessen and I ordered the roast chicken which has become something of an obsession with me lately. I was impressed with the way they roasted it in eight cuts so I figured I would try a take of that at home. I highly recommend Delicatessen, by the way. Even though it's not actually a delicatessen. 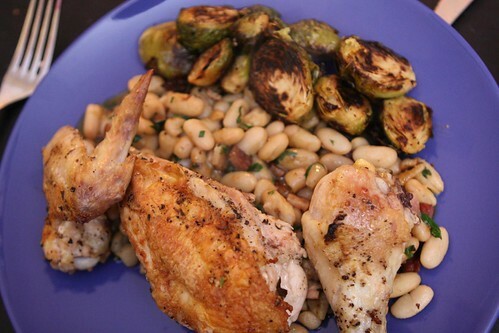 After roasting the chicken I served it with some pan roasted Brussels and canellini beans that I cooked with some rendered bacon, some of the pan juices from the chicken, and some freshly chopped parsley. 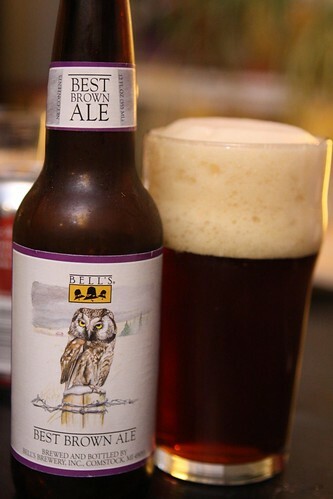 Tonight, to accompany dinner, I had the last of my Christmas present beer varieties from my bother and sister-in-law, this Best Brown Ale from Bell's Brewery, Inc. Sadly Bell's only had distribution in Michigan, Indiana, Ohio, Pennsylvania, Kentucky, Missouri, Wisconsin, Minnesota, North Carolina, North Dakota, Florida, Virginia, Arizona, Georgia, Alabama, Iowa and Puerto Rico. Nothing in New York. Wait, Puerto Rico? They load up their beer in a plane and fly it over New York to Puerto Rico? This is why American beer distribution is so annoying. It does make for some charming regional differences and makes things very interesting while traveling but it doesn't really make any sense beyond that. This was a fine nut brown ale. It reminds me of college when I last had a Newcastle. It makes me wonder if Newcastle is actually this good. Probably not. As I remember from one of my favorite episodes of Oz & James Drink to Britain Oz Clarke was less than impressed with the old classic even though he too enjoyed it as a student though I would wager a guess that he and I were not students at exactly the same time. 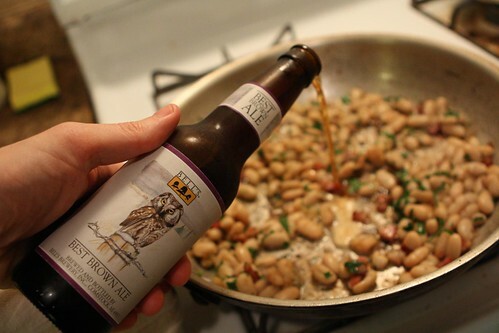 Naturally, when a beer is this good, I like to share it with my dinner. 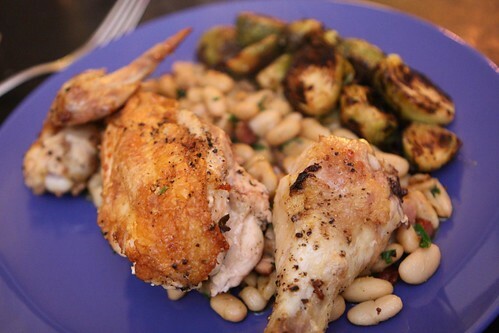 In this case I added a little to the white beans as I cooked them. 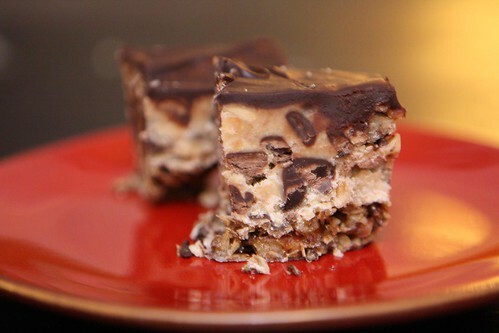 After properly chilling in the fridge the spent grain peanut butter chocolate bars I made were feeling a little more photogenic today. I sliced up a couple of chunks of this. The chunks were actually tiny which is good because I think this recipe is about 50% butter by volume. It will probably take us the next month to eat all of it so it probably won't be too detrimental to our health. I'm just hoping the twins are not born with cardiovascular disease.